Project information changes. Can your project cope? As a new project is started and progresses forward many of requirements you define and capture will change, be added to, or sometimes removed through the course of development. Rational DOORS Next Generation provides the functionality to help track requirements information change so that you can understand what has taken place throughout that process. Rational DOORS Next Generation will automatically track and record who modifies information, what changes took place, and when it happened. This information will be crucial when you need to run reports like project efficiency or the churn in a project leading to delivery. Beyond tracking your history Rational DOORS Next Generation also lets you capture baselines (or snapshots) of your project requirements which will give you a version of your project at points in time. Once again using a project baseline you will be able to compare change over time to see what areas of your project have had the most churn and change. 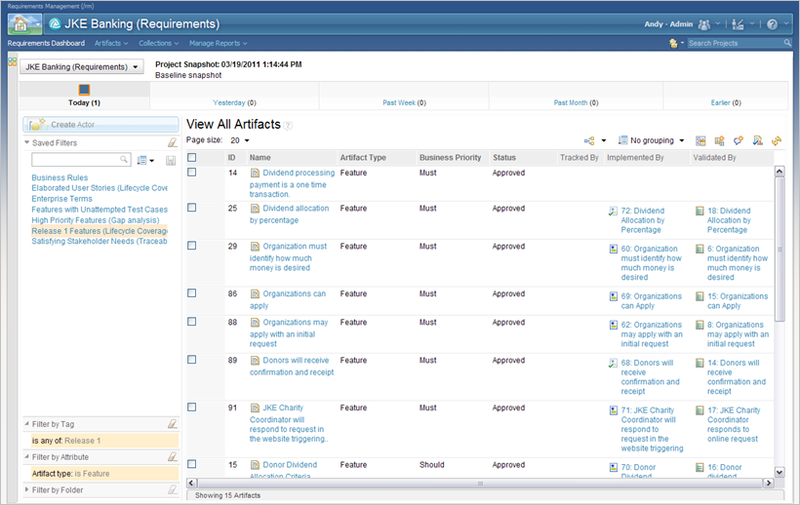 You can capture and define requirements in records called artifacts. These artifacts have many special functions but one most important is the way each artifact history is tracked and maintained for you. When you review and analyze your project information and explore requirements change or just want to know what has happened to a particular requirements you can access all prior revisions of the artifact to see what modifications have taken place (in red-line mark-up). You can discover when the change happened and when the change was made giving you important insight to the way your project will progress over time. 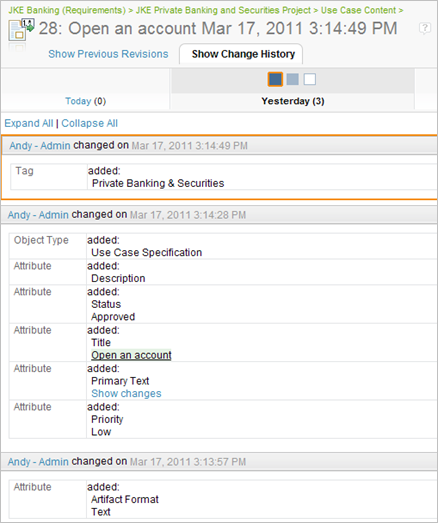 The history of a requirement artifact also lets you restore any previous versions if a mistake was made or a change decision is reversed. Think of it like the ability to “undo” any project change through out the lifecycle of your project. These baselines will give you the peace of mind of knowing you can always return to see what your project information looked like at that specific point in time. All requirements both text based and graphical as well as traceability will be captured in a project baseline. This baseline can be then used at any point to help you further analyze and discover changes to your current requirement artifacts. Or you letting you compare them to see change reports and let you know where your project has changed from one milestone to the next.